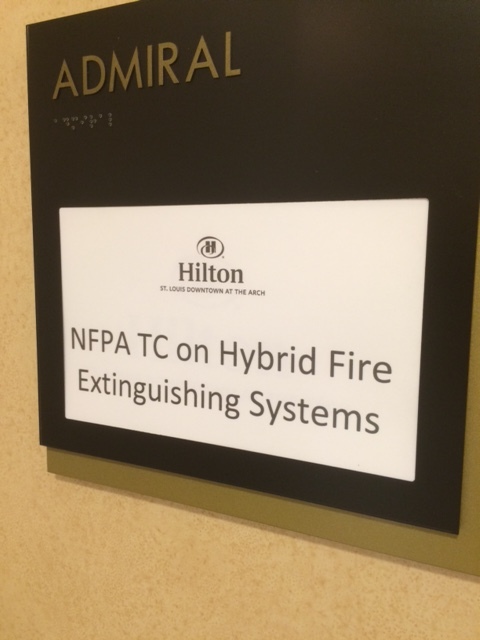 The new NFPA technical committee on Hybrid (Water and Inert Gas) Fire Extinguishing Systems began its inaugural meetings in St. Louis, Missouri on Tuesday and Wednesday, September 29 and 30, 2015. Looking to develop the new NFPA 770 Standard on Hybrid (Water and Inert Gas) Fire Extinguishing Systems, the committee was represented by nine principal members, an alternate principal member and several guests. Chairman Jeffery Harrington of the Harrington Group is leading the committee in the establishment of standards related to this fire fighting technology that has been gaining marketplace acceptance for over the past 10 years. At its October 2014 meeting, the NFPA Standards Council voted to approve the development of a new committee and a new document on Hybrid (Water and Inert Gas) Fire Extinguishing Systems. The Council directed that a call of members interested in serving on the proposed new Technical Committee be published. NFPA Staff was directed to return to the Council with a proposed startup roster and a proposed committee scope. APPROVED COMMITTEE SCOPE: This committee shall have primary responsibility for documents covering the design, installation, operation, and maintenance of hybrid (water and inert gas) fire extinguishing systems that use a combination of atomized water and inert gas to extinguish fire. This scope does not include systems that use only inert gas or only atomized water (water mist) to achieve extinguishment. It also does not include twin fluid water mist systems that use inert gas to propel and/or atomize water mist droplets without generating a significant inert gas concentration in the protected space. The committee will continue to work on its scope, and the standard for the next several months. To learn more about the committee and its progress click here.